Briana Alessio (NDI#47) Briana is the DDL Atrractions Blogger. She lives in New York and is a student of SUNY Empire State College. She is a Christian, loving God with all her heart. She also has a passion for animals, music, and films. Briana has loved Disney since she began speaking and continues to love it to this day. In fact, her dream is to be a Cast Member. She also co-hosts The Disney Film Project Podcast (@DisFilmProject), writes a blog called The Adventures of Brie (adventuresofbrie.blogspot.com), and is known to the Twitter world as @BufferflyBrie. You climb aboard a time rover. Everything is going smoothly as you are watching dinosaurs graze and stroll the jungle…but this is only for a short time. There is a meteorite coming your way! You have to save yourself! 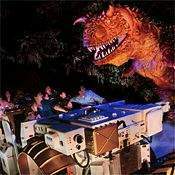 The attraction I am speaking of can be none other than Dinosaur in Disney’s Animal Kingdom in Lake Buena Vista, Florida, which is located in the Dinoland USA portion of the park. Originally, this was called Countdown to Extinction, which opened the same day that Animal Kingdom itself opened, on April 22, 1998. However, it was re-named Dinosaur to promote the film, also called Dinosaur, which opened in theatres on May 19, 2000. There are no obvious mentions about the film in this attraction, although the two main dinosaurs are the iguanadon and carnotaurus, both of which were significant breeds of dinosaurs in the film. When you enter the Dinoland Institute Building, you can see real dinosaur remains and a narration by the one and only Bill Nye the Science Guy (who can also be seen over at Ellen’s Energy Adventure in the Universe of Energy building at Epcot, only a bus ride away!). After walking through this part of the queue, you enter the pre-show room, where there is a short video from Dr. Marsh telling you that you are going to be on this calm journey of some sort. Right. Shortly after, Dr. Seeker enters the picture and informs us as to what is REALLY going to happen. After the video, you are led down a staircase and into the loading area. Once you board the Time Rover, some bright lights flash around you, then you see some stars before entering the jungle. Certain dinosaurs cross your path, some friendly and some not-so-friendly. I do not want to spoil much for those who have not been on this attraction yet. However, I highly recommend it. The crew at Walt Disney Imagineering did a fantastic job on this attraction. Hint: Your picture is taken when the carnotaurus appears in its full height and lets out a big roar. When you can sense this part is happening, put on your brave face! There are normally Fastpasses available (to check availability, crowd levels, etc check out the Touring Plans website), and it is wheelchair accessible as well. The entire attraction is three minutes and five seconds, and you must be 40” to ride. I realize that they give a mandatory height to ride this, but even if they are 40” and at a tender age, we know full well that it all depends on the maturity of the child. They may be quite young and not be able to handle the intensity of this. To be completely honest, I have only been on this ride once, which was in 2007. I was terrified and practically had my eyes closed throughout the duration. However, on my next trip in May, I plan to ride again, this time in the front row, with eyes wide open and a positive attitude. After all, I will make it out alive…right? I’m going to survive this, right?